Aloe Vera – Aloe is naturally anti-inflammatory and great for skin. It is moisturizing without being oily and is perfect for those with normal or slightly oily skin. Rich in nutrients and antioxidants, it is often used in anti-ageing skin products as well. Witch Hazel – It is slightly antiseptic, which makes it cooling and great for skin. In fact, it is often used to remove excess oil and fight blemishes and blackheads. Its ability to shrink blood vessels and reduce inflammation makes it beneficial for hemorrhoids and also for cooling the body. Peppermint Essential Oil– Most aromatherapists would say that in this small concentration, peppermint is generally considered safe. However if you don’t feel comfortable using peppermint essential oil, you can leave it out of your spray (witch hazel is cooling on its own). 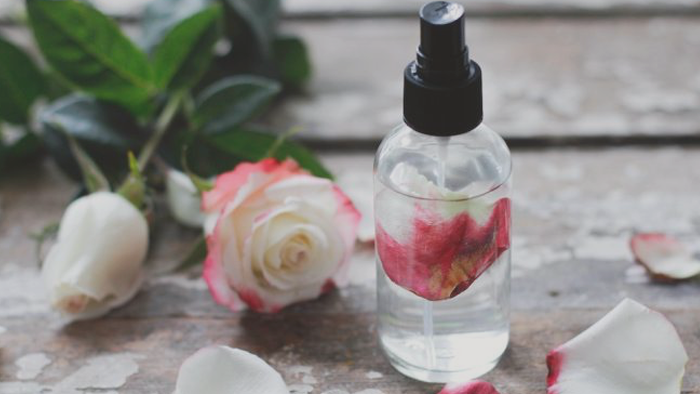 You could also infuse dried or fresh peppermint leaf into the witch hazel for a week or so before making this spray for a less concentrated version. To do this, add 3 tablespoons of dried mint to a glass jar and cover with 1/2 cup of witch hazel. Cap tightly and stir daily for 1-6 weeks. Strain and use the witch hazel. A quick spritz of this super-simple cooling spray on the skin feels amazing on a hot day and makes great after-sun care as well. Shake or stir until well mixed and blended. Spray as needed to help cool off in the summer or on bug bites or sunburn.